Tabbouleh is one of my favorite ways to prepare Quinoa. Traditionally made with wheat, this is an equally delicious gluten free version! 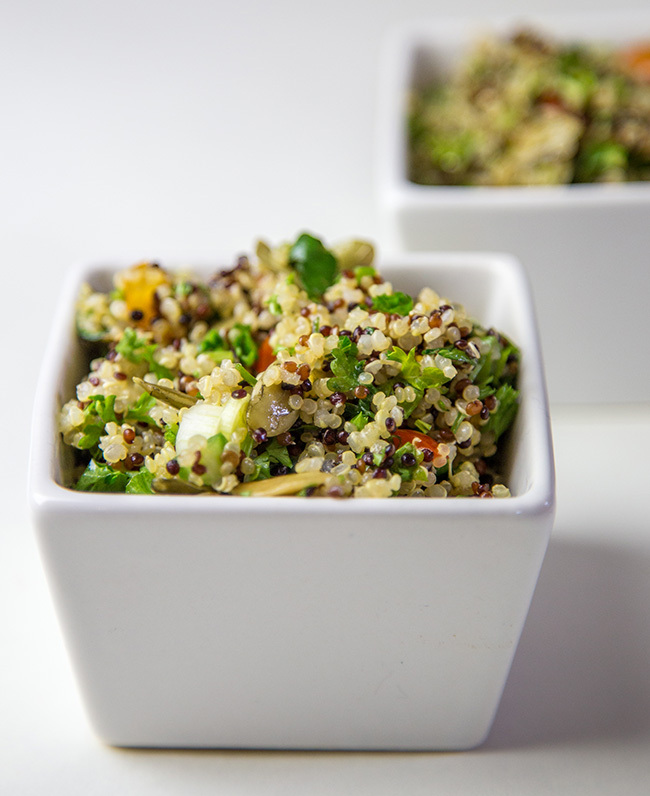 I hope you enjoy this healthy Quinoa Tabbouleh Salad Recipe. This dish has many names, and almost as many opinions about how it should be prepared! And for good reason. Tabbouleh is a dish that originated in the Levant, which is a large area of land east of the Mediterranean Sea. This land is now covered by several countries including Israel, Syria, Lebanon, Jordan, and others. Therefore, tabbouleh’s history does not stem from one particular country, but from this large region of land that dates back before many of those countries were even founded! That probably explains the numerous variations of tabbouleh: as time passed and the Levant broke up into smaller countries, each region, whether consciously or not, developed their own spin on this signature dish. 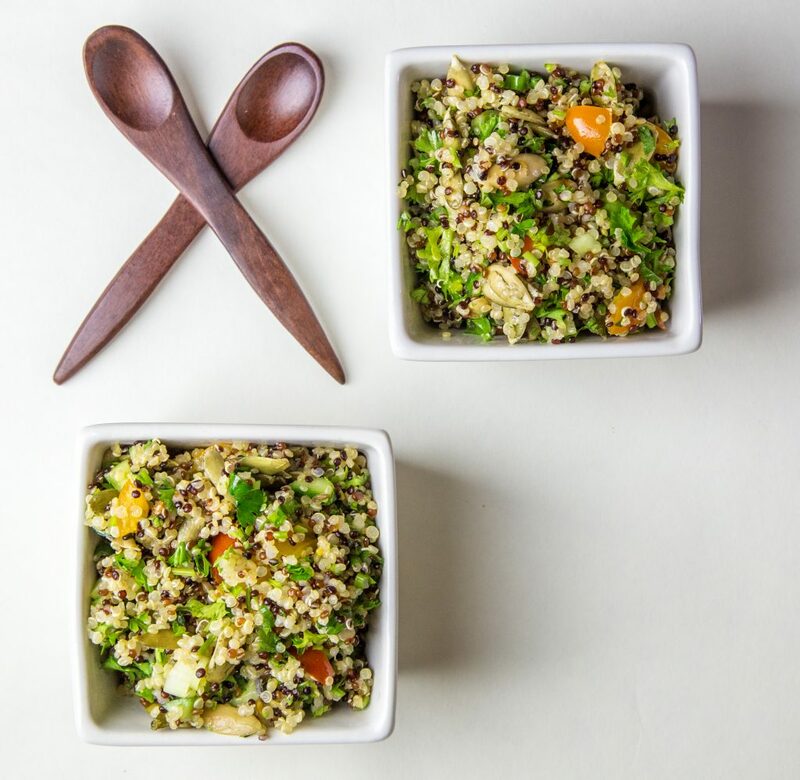 One ingredient that is a common in most forms of tabbouleh is bulgar wheat. However, for this recipe, I’ve swapped out quinoa for the bulgar for a few reasons. 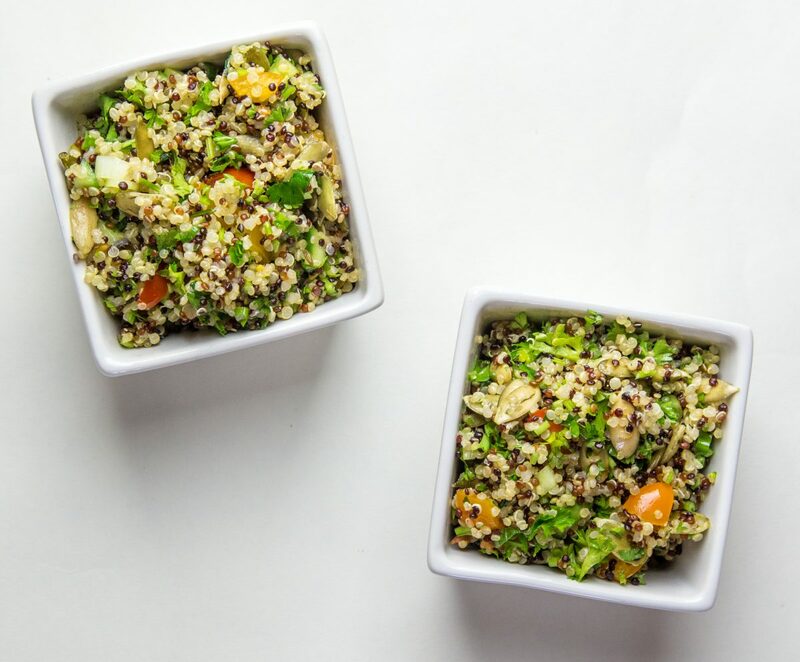 Although bulgar has less calories and more fiber than quinoa (cup for cup), quinoa’s dense little kernels (they’re actually little seeds) contain more nutrients like protein, copper, magnesium, and phosphorus. Quinoa is also gluten-free, making this dish more accessible to people with gluten allergies and to hippies in California, like me. Of course, let’s not forget about all the other great things that comprise tabbouleh like mint, cilantro, parsley, and lemon. FYI, 1/4 cup of lemon juice provides 47% DV intake of vitamin C and just 1/4 cup of fresh parsley has almost 300% DV of vitamin K (both for a 2,000 calorie diet). Not too shabby. Many Tabbouleh recipes also include the use of cherry or grape tomatoes. In my recipe below, I’ve included them only for optional use. For those following food combining techniques, tomatoes are technically a fruit and should therefore be eaten alone. For my personal chef clients, I normally pair this dish with Homemade Hummus and grilled veggies such as asparagus, zucchini and broccoli. In a small bowl, whisk together olive oil, lemon juice, vinegar, sea salt and black pepper. In a separate bowl, mix scallions, cucumber, parsley, and cilantro. Add cherry tomatoes and mint, if using. 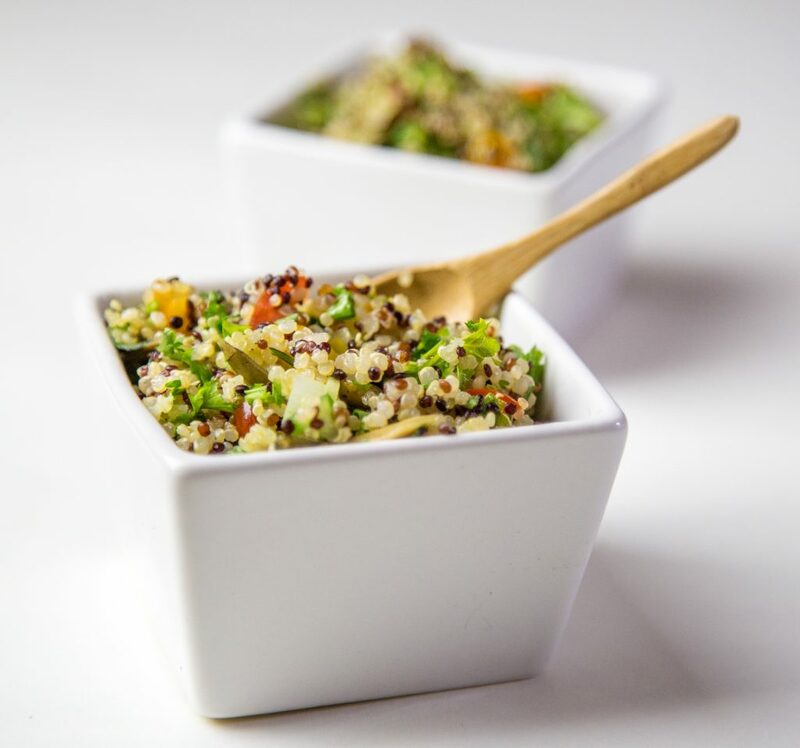 Place quinoa in a large mixing bowl and fluff with a fork (this keeps the dish light and airy). Slowly drizzle olive oil mixture over the quinoa and fold in herbs and cucumber. Add sunflower seeds, if using. **Persian cucumbers have less seeds and seem to be less wet inside, making them great for a dish that calls for finely diced cucumbers. ***If the quinoa becomes overcooked and is stuck to the bottom of your pan, let it sit covered for 5 minutes, allowing the steam to un-stick it.